pp. 8 - 11, illus. 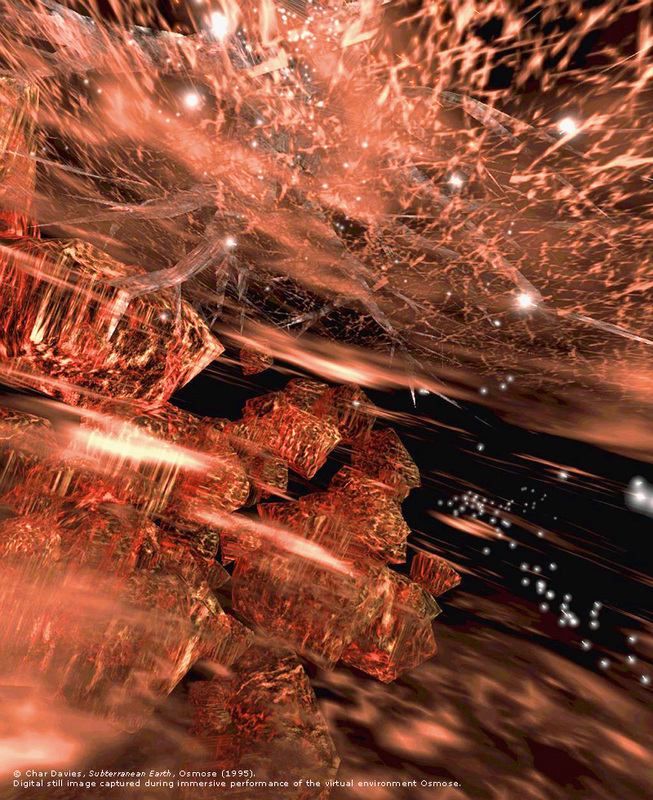 The title of this article refers to the immersive virtual reality artwork Osmose, created by Canadian artist Char Davies and her team at Softimage. Osmosis: Any process by which something is acquired by absorption. The French translation for the word Osmosis is Osmose. Osmose is the title of the Virtual Reality art work that is the subject of this article. In the seventeenth century Rene Descartes posited a strict separation between the realm of human consciousness and the natural world. This way of thinking has been widely accepted in the western world, and has helped shape our cultural values. Descartes devised a co-ordinate system, a grid created by the x, y, and z axes. This grid is the foundation for most of today s computer graphics. It produces a cold linear environment, quite the opposite to the world of 'Osmose'. Recently there has been some criticism of the computer-graphic establishment for its endorsement of a gendered Cartesian space. Computer-graphic production as seen in commercial cinema, video games, theme-park ndes and military simulations, is allegedly dominated by a Western male psyche and worldview (Penny, 1994, p. 231). Osmose involves a shift away from VR's usual Cartesian space. It is composed of several different elements, a tree standing in the middle of a clearing, a forest, water on a lower level, the computer code in another lower level and the text (poetry, philosophical texts, etc.) on the upper level. All those elements are not separated in different rooms as usual in VR but belong to the same global structure that you travel through. The lowest level within the world of Osmose is the code world. Recognising that Osmose is essentially software, Davies literally placed its programming at the bottom of the virtual universe. According to Davies, these two worlds act as symbols of concrete reality bracketing the world within. They remind the immersant and the viewers that Osmose is a highly crafted construction, a product of both great technological sophistication and intensive conceptualization (Davies, 1995). The main driving force behind the creation of Osmose was 'a desire to heal the Cartesian split between mind and body, subject and object," which according to Davies 'has shaped our cultural values. "(Davies, 1995, p.1) The work was inspired by a profound deep-sea diving experience in the Bahamas, where Davies got an unforgettable taste of virtual space. Through Osmose, Davies is trying to give the immersant the kind of profound experience she had underwater, an embodied experience of space, one that begins to dissolve the habitual boundaries we maintain between inside and out, between self and world. Davies in her essay 'Being in Immersive Virtual Space', writes about the spaces that we, as humans, have access to throughout our lives, most people being limited to life as experienced on the surface of the earth. (Davies 1995 p.4) This is reflected in the design of conventional VR, as most designers rely on everyday experiences of terrestrial space to define the appearance of their virtual worlds These worlds end up being filled with hard-edged objects, horizontal floors and walls. The interface methods are also based on things we experience every day, such as walking or driving. 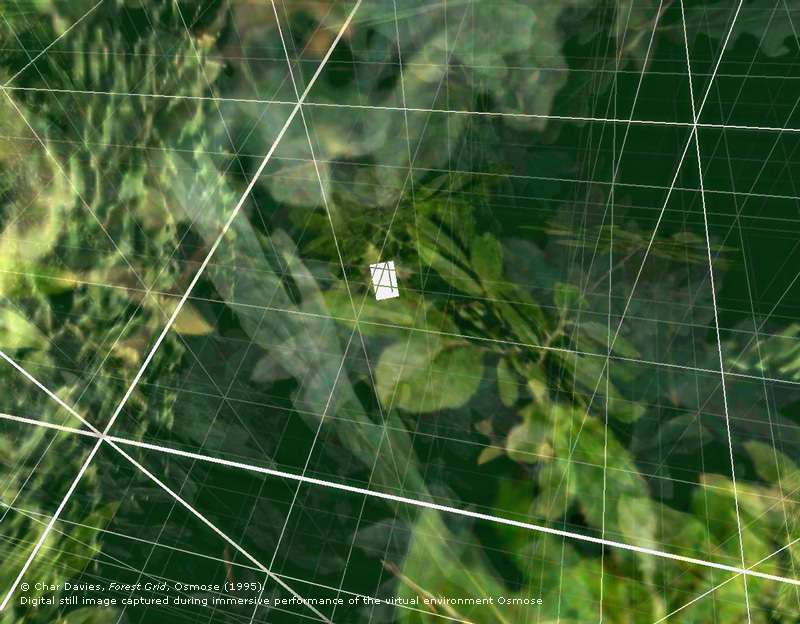 These approaches to 'immersive' virtual space limit its potential, and uphold the conventions of a western world view. Osmose is a different kind of space. Ambiguity and transparency are the dominant aesthetic. Osmose does not try to 'Re-Present' a world that already exists in another place; it is a space that only exists within the programming of the computer. Conventional VR projects reduce the human subject to an isolated and disembodied being manoeuvring in empty space. Cyberspace is the epitome of Cartesian desire, for it enables us to create worlds where we have total control. The long term effect of this, according to Davies, may be to seduce us away from our bodies and ultimately nature. In conventional VR the body is a void. VR arms the eye, it gives the eye a hand of its own, propelled by the gaze itself. The entire body is propelled by scopic desire. We are taught to regard our bodies as an instrument, as apparel, our culture customizes its bodies like it customizes its cars. The body is a representation oniy, an external appearance, and may be adjusted to suit the taste of the owner. The absolute malleability of the virtual body is different from this only in degree. VR replaces the body with two partial bodies, the corporeal body, and an incomplete electronic 'body image'. On a bodily level, the conventional VR experience is of dislocation and disassociation. This is precisely what Char Davies is challenging with Osmose. In Osmose there is no reference to the body, there is no representation of the body. This leads one to look within one's self, for one's own body image. The 'meat' body, when one is experiencing conventional VR, becomes only a machine to press the appropriate buttons or to re-aim the viewpoint, driven by a desiring, controlling mind. The body does not feel, it does not register the virtual world. Only the eyes, privileged as the most accurate of the senses since the Renaissance, register the virtual world. Michael Heim, when writing about virtual reality, referred to a "leaving the body at the door of the virtual world," but what body is being left at that door? Karen A Franck suggests that it is the 'fleshed' body. The body that needs to eat and sleep, the one that is frail, can become diseased, and will die. She believes that this desire to transcend the flesh body is a masculinist dream (Franck, 1995, p. 22). Davies challenges this masculinist dream by not leaving the body outside, but by bringing the body 'in' to that virtual world, and making it a part of the piece itself, creating a 'natural” interaction between the participant and the virtual world. It is the user's body that controls his or her journey through Osmose. In most virtual environments, motion is controlled by a joystick or other manual device that gives the user a kind of godlike control. The work avoids the 'masculinist” preoccupation with tropes of penetrating or mastering space reducing our chaotic experience of reality to a more manageable oversimplified model i.e. mastering the world on our terms rather that experiencing it as it is. VR is a safe environment to explore the mind-body experience liberating us from the everyday impulse to prioritise the mental over the physical. Osmose offers a new, more physical approach to the relationship between the perceiving body and the spaces of information. The interface does not bracket out the bodily processes from the means of accessing information, as does most current interface technologies such as the World Wide Web, where pointing and clinching phallic tools is the only means for interactivity. In Osmose, sense of balance and breathing constitute an interactive surface that, while moving the body in the immersive space, simultaneously alter the physiological condition and state of the body. Deep breath does not only move the 'immersant' in relation to the stereoscopic 3D space but it also brings more oxygen to the body and affects its physical and chemical balance. In the immersive environment of Osmose the border between the interface as a symbolised surface and the surface of the physiological body begins to blur. Warwick Fox in his essay "Deep Ecology: A New Philosophy of our Time?" (1984), gives a brief but concise overview of the differences between shallow and deep ecology. In shallow ecology figure/ground boundaries are sharply drawn such that humans are perceived as the important figures against a ground that only assumes significance in so far as its use value for humans. This figure ground boundary could be used as a metaphor when talking about Osmose, for in Osmose there is no defined ground and there are no defined boundaries. This purposeful leaving out of a ground serves simply to place the immersent in an environment, rather than dominant over it. It has been argued that it is misguided sentimentality to suppose that we can simply transplant the values and beliefs from other cultures to our own (Grey, 1986). Osmose does not simply transplant philosophical ideas from one culture to another, it brings those ideas to us in a new medium, through a profound experience visually. Osmose ignores the fact that the computer technology that it uses to heal the human/nature split is the same technology that that trains fighter pilots to blow it up. Perhaps Davies is simply showing that this technology can be used in less harmful ways than military training. It is a point that Davies has not addressed in any of her writings about Osmose. It seems that the goal of conventional VR is reached when we cannot distinguish between the computer image and the real thing. According to some, the only thing that VR has achieved is the reduction of space to numbers. VR reflects a longing to transcend the limitations of our physical surroundings, Davies believes that the long term effect of this may be to seduce us away from our bodies and ultimately from nature. The names of the worlds in Osmose are based on Heidegger's writings. But what would he have thought of VR? Richard Coyne argues that Heidegger would have had little time for a technology that tries to simulate reality by building up an experience from geometrical co-ordinates or barraging the viewer with sense data. (Coyne, 1994, p.68) He argues that Heidegger would have seen the idea of constructing reality (or its resemblance) through data as untenable. It would be as if to say 'nature' is constructed, so let us re-construct it in a computer. This is one of the paradoxes of Osmose, it is not supposed to 'Re-Present' nature, it is supposed to provoke a feeling of nature, and a feeling of being in the world. But according to Heidegger our primordial understanding of being in the world is one of undifferentiated involvement. The idea of VR is the opposite, in that everything in the field of view is presented to the senses. "VR is a literal enactment of Cartesian ontology”, according to Coyne, "cocooning a person as an isolated subject within a field of sensations and claiming that everything is there, presented to the subject" (Coyne 1994 pp.68). Everything that Heidegger suggests about our being indicates that we are not constituted like sense data receptors. Laurie McRobert, on the other hand, argues that Heidegger would have seen Osmose as a bringing forth of truth. In Western culture we are already being prepared for the 'condition' of VR, through the spaces that we live in. If we are teaching ourselves now that we can experience the countryside through the window of a car that is travelling at sixty miles per hour, then it is only natural that in the future, we will teach ourselves we can experience nature through VR. Is there a danger that Davies made the piece too well, by this I mean could people resign themselves to the fact that nature will be lost, and accept VR as the next best thing? It is a possibility, but the feeling of 'being' in a natural' environment and the feeling of 'being' in a virtual environment are very different things. I see VR following the male-gendered, mission orientated aesthetic for some time. But I feel Osmose is the first good 'virtual' stab at what VR can be, a meditative, contemplative space, where one can learn to appreciate what we still have in our tactile world. Coyne, Richard, “Heidegger and Virtual Reality: The Implications of Heidegger’s Thinking for Computer Representations" in Leonardo Vol. 27, No. 1, 1994, pp. 65-73. 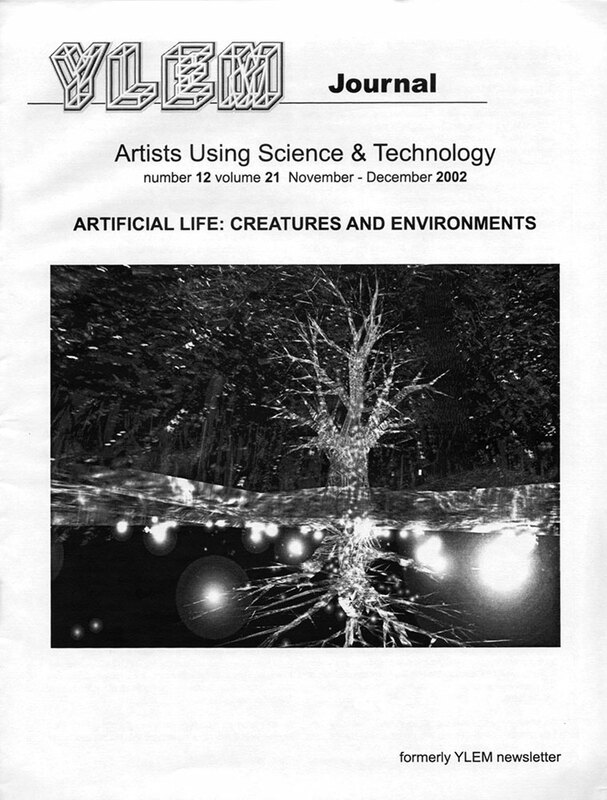 Davies, Char, “Changing Space: VR as a philosophical Arena of Being", in Consciousness Reframed, Conference Proceedings, University of Wales College, 1997. Franck, Karen A. “When I enter Virtual Reality, What Body Will I Leave Behind?" Architectural Design Architects in Cyberspace’, Vol. 65, No 11/12, Nov-Dec ’95, pp. 20-23. Gigliotti, Carol, "Aesthetics of a Virtual World", Leonardo, Vol. 28, No. 4, 1995, pp 289-295. Heim, Michael, “The Design of Virtual Reality” in ‘Cyber Space, Cyber Bodies, Cyber Punks: Cultures of Technological Embodiment', (Ed.) Mike Featherstone and Roger Burrows, London, SAGE Publications Ltd., 1995. Penny, Simon, “Virtual Reality as the Completion of the Enlightenment Project” in (Ed.) Bender/Pruckney., “Culture on the Brink: Ideologies of Technology”, Seattle, Bay Press, 1994.